Markings:Black liners around eyes and black paws. 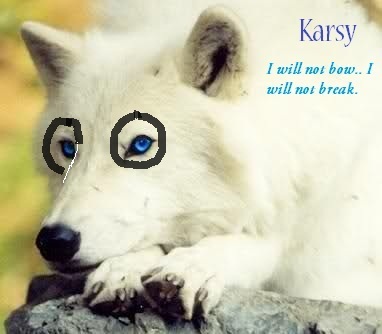 Histrory:It's not long really.Karsy was born in a aggressive and dominant pack.She was banned when was one year old.From then i growl up as a loner till i came to this wonderful pack. Likes:To hunt and fight a bit and exploring around.